I am an unabashed fan of Supermarket Sweep. I’ve watched way too many episodes between when I was younger and the occasional rerun I come across. I’m pretty sure it falls squarely into the guilty pleasure category between the outright cheesiness and the fact that the whole thing takes place in a grocery store. Overall, it’s definitely one of the more ridiculous game shows to ever appear on the air and the level of 90’s happening here is borderline unexplainable. The first incarnation of Supermarket Sweep actually aired in the 60’s on ABC, but was nowhere near as entertaining as what we’ll find in the below episode. Also, almost all of those episodes fell victim to the practice many networks had of taping over old reels, so only seven remaining in existence. The 90s + Lifetime + Grocery Shopping = MAGIC. Since there’s no way I can impart how awesome this is without you just watching, we’re going with a running diary style breakdown of an episode from 1994 (closer to the end of the original episodes). :10 What do you think Dave Ruprecht had to do in the audition to land this gig? Pretty sure “make sure your shirt doesn’t clash with the vegetable stand” was involved. :24 Never underestimate how awkward the silences can be waiting for people to answer. :42 Kari runs to get the cat food for a bonus cash prize, only to reveal that she paired the uber-90’s vest she’s rocking with a pair of bright red pants. It only gets better folks. 1:11 Our first of three introductions to the contestants. Lizz (two z’s!) seems to have trouble remembering that Tammy is her friend. Ok, then. 1:27 We learn that Lizz is a permanent makeup artist. Which means tattooing on makeup. I’m just going to move on. 1:39 Mark and Jennifer remember who they are to each other and what they do for a living immediately after the question is asked. Congrats you two! 2:00 Is Kari still out of breath from running to a shelf and back? Absolutely. 2:19 The way the contestants not currently answering half skip away from the podium is still funny after three watches. 2:30 “I’m going to read statements that could have something to do with these products” … You’re reading commercial quotes Dave, don’t make it seem like something it’s not. 3:18 Vicki got the brand before Dave finished reading the clue, but he wanted to speak in a British accent so badly he did anyway. 3:44 A pre-commercial fun fact! See kids, you are learning something from all this. 4:02 You’re never going to get the Coast in time if you prance around the store like that Jennifer. 4:31 …And she doesn’t. Misses it by one second. That hurts. 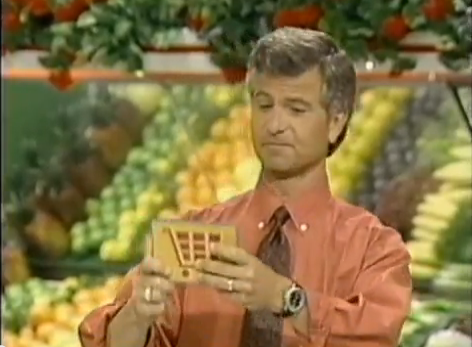 5:34 In which we realize the “30-Second Shootout” is sticking Password inside another game show. I’m assuming this was never a problem because no one from the Password legal team ever watched an episode of Sweep. 6:12 Did you hear the rule that Dave just added into the mix? Tuck that new information away for a little while. 6:46 The close-ups here really allow us to be sure of the fact that Tammy and Lizz with two z’s are just blowing away the competition when it comes to hair styles. Nobody else stood a chance appearance wise. 7:01 Except for maybe Jennifer and Mark, who are just plain killing it in the wardrobe department. All denim everywhere, naturally. 8:36 So. Much. Switching. Happening. 10:10 Going into the Big Sweep Vicki and Kari are in the lead, followed by Tammy and Lizz with two z’s & Jennifer and Mark in 20 second increments. 10:42 I really wish they had left the commercials in this video, the analyzing that would’ve gone on…I mean wow. 11:05 ¡Lo Scandalo! Tammy and Lizz with two z’s had 30 seconds taken away during the commercial break because they re-used a clue during the “30-Second Shootout”. And that’s why you always pay attention when Dave is explaining the rules to you. 11:37 Frozen yogurt is one of the bonuses available for the teams to bring back this time. Those flavors alone are enough to induce some cheese-related queasiness. Vanilla Bean Dream? Really producers? 12:40 Contestants aren’t allowed to knock over any displays or run into any cameramen/products/other contestants. Vicki’s “shield the cart with my body” strategy is actually a pretty good one. 13:00 Only five of each product allowed in the cart (preventing people from stocking up in the pharmacy isle or meat section). Both Mark and Lizz with two z’s head for the expensive stuff first. Smart. 13:51 Vicki goes for her second bonus product of the round. Strategy, strategy, strategy. 14:42 Mark heads for cooking wear. Something tells me the space being taken up in the cart won’t be worth it in the end. 15:13 I’m genuinely worried about Mark’s inability to pick up a turkey. 16:33 Mark and Jennifer had 10 seconds more on the store floor and ended up with more than 100 dollars less than Tammy and Lizz with two z’s. Just poor planning on display right there. 17:06 But it doesn’t really matter in the end because Vicki and Kari blow everyone else out of the water. Power team from the very beginning, never took their feet off the gas. 17:45 One minute to find a few products off of clues doesn’t seem that hard, but you would be surprised how many pairs fail. 18:24 They both get the clue completely wrong, yet Kari still manages to find the $5000 ticket. I mean seriously. 18:30 What happens now is the equivalent of what happens when little kids lose their mom in a store and run from aisle to aisle looking for them but she’s actually in between displays so looking in an aisle doesn’t help at all. Except with 30-somethings in a fake store. 18:49 Well it wasn’t the least awkward group hug between a host and two contestants of all time. 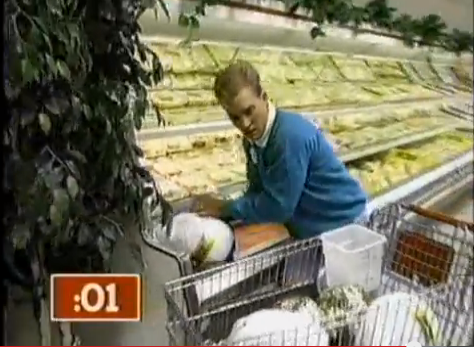 So there it is everyone, Supermarket Sweep in all of it’s glory. To me it’s interesting that this was one of Lifetime’s most popular programs during the 90’s. After so many brand shifts in the past 10 years or so it is easy to forget that the main goal of their programming was to give stay at home moms something to watch while taking care of the kids. 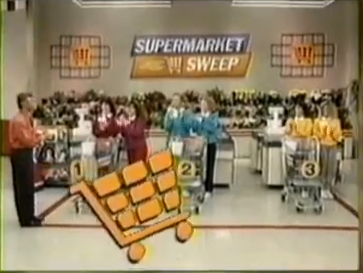 Daytime programs that weren’t soaps were in short supply, so Supermarket Sweep gave moms what amounted to a busman’s holiday of a game show experience. Watching people run around and fake grocery shop is a lot more exciting than actually grocery shopping. Sweep allowed viewers to be entertained by an activity they knew all too well, with enough of a twist so as not to be a reminder of the chore list waiting in the back of their minds. Question: is this more or less embarrassing for Ruprecht than THE HARLEM GLOBETROTTERS ON GILLIGAN’S ISLAND? -I’d like to think Dave Ruprecht’s wife made him do the food shopping. -My sister and I used to play this whenever we went food shopping with our parents. And whenever there was a giant display thing (usually an inflated Kraft Mac&Cheese dinosaur) I was hoping we could take it for extra money. -It then led to a lifetime of confusion where I did not realize the goal was to spend the most money. -Where are the matching shirts? My biggest memory of this show was always that each pair wore matching shirts. -I would argue that “my husband’s name” is only the same clue if the husbands had the same name. -Where do you think these people are now? Do you think Lizz is still tattooing on makeup? Do you think she’s shortened it down to 1 z?